So, I took basically no photos of the making of this gown, nor did I document it...because I made it in about a week and didn't talk about it online because I wasn't sure if I'd be able to finish it or not! 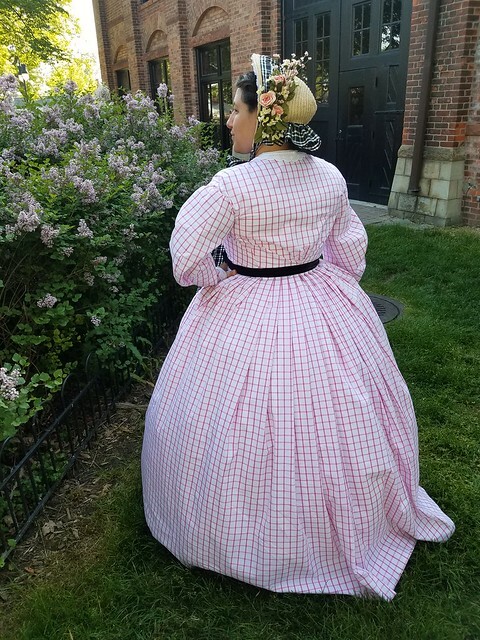 Fortunately, it was a very simple dress and turned out to be perfect for the quite-warm weather we had over Memorial Day weekend this year. 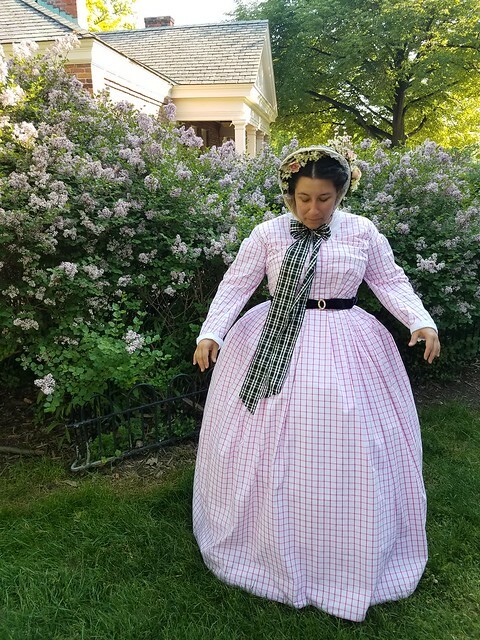 The fabric is a semi-sheer cotton from Fashion Fabrics Club, and the dress is constructed with a fitted half-high lining, gathered bodice, simple coat sleeves, and a pleated skirt. I'd love to say it's worn over perfectly period undergarments but in reality it's probably whatever chemise I could find (likely linen, regency), my Redthreaded 1860s gored corset, and cotton knit shorts, because I'm super lazy about my undies. Sorry! Oh, but I do have a Needle & Thread small wire hoop and two crisp cotton petticoats, so I've got that going for me. Being so simple, the dress is really a blank canvas and the accessories do a lot to dress it up. 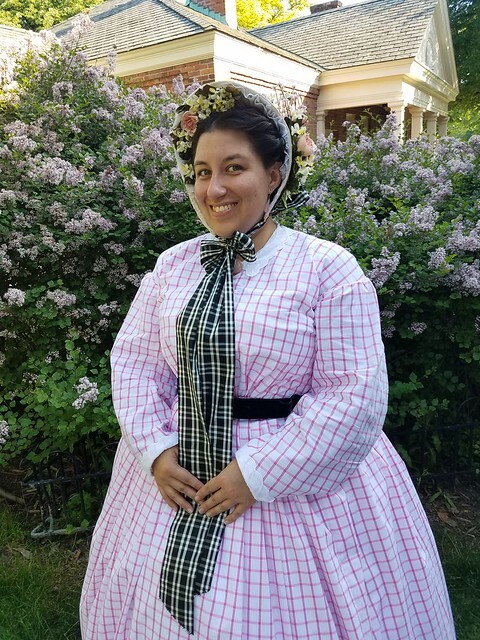 The belt is a length of velvet ribbon with an antique buckle from Originals by Kay, and the bonnet is a straw form from The Dressmaker's Shop. My friend Elizabeth from That's Sew Minnesota decorated it for me and did an *amazing* job! She used velvet millinery flowers from A Pink Swan and Timely Tresses, along with cotton net from Dharma Trading and checked ribbon from Fini Ribbon on Etsy. The collar and cuffs are embroidered cotton lace from The Dressmaker's Shop on cotton organdy.